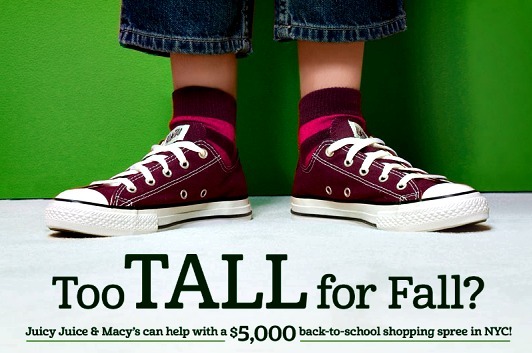 Has your child had a growth spurt this summer and can’t fit into last year’s clothes? Before you finish your back to school shopping, celebrate how much they have grown and then be sure to enter the Perfect Fit Sweepstakes brought to you by Juicy Juice ® & Macy’s with your funny photo in the #PerfectFitSweeps. Simply share a “misfit” picture of your kid (13 years or younger) dressed in the clothes they have outgrown for a chance to win with this amazing sweepstakes! You’ll be entered to win a trip to NYC and a Perfect Fit shopping spree for your child at Macy’s Herald Square as well as Juicy Juice product for a year! The sweepstakes runs from August 8th at 12pm to September 12th at 11:59am and is easy to enter! No picture? You can also enter by submitting a funny story about how you realized that your child had outgrown an item of clothing, in 140 characters or less. Facebook: visit https://www.facebook.com/JuicyJuiceUSA and click the Perfect Fit Sweepstakes brought to you by Juicy Juice & Macy’s tab link or www.perfectfitsweeps.com if participating via mobile device, entering all required registration information (first name, last name, complete address, including zip code, email address and daytime telephone number), following the instructions to upload your Photo/Essay and certifying the child depicted or described is your child/legal ward and that you have read and agree to the Official Rules to receive 1 entry into the Sweepstakes. You must have a Facebook account to enter via Facebook. There is a limit of 1 Facebook entry per person/email address/day. Get a bonus entry by sharing the sweepstake via Twitter! 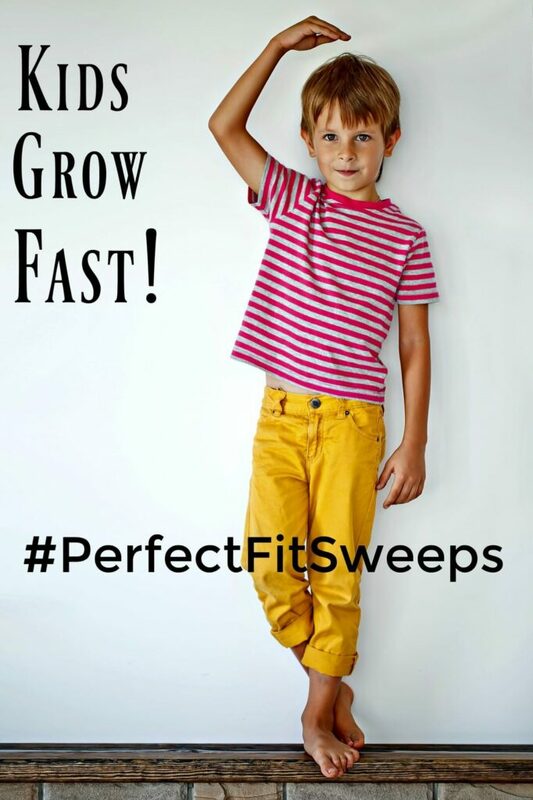 The tweet must contain #PerfectFitSweeps to be eligible. Once you have entered via Facebook, you will also be prompted to share the Sweepstakes on Twitter via the link provided on Facebook to receive 1 additional bonus entry into the Sweepstakes. The link must be shared publicly. (An additional bonus entry will not be received if the link has been modified or altered in any way or if the link is accompanied by any content that is inappropriate, unsuitable or otherwise in violation of the content guidelines set forth below for entry, all as determined by Sponsor in its sole discretion.) There is a limit of 1 bonus entry per person/Twitter ID throughout the Sweepstakes Period. A 3-day/2-night trip for winner and 3 travel companions (including child depicted/described in Entry) to New York, NY. Trip includes round trip coach class air transportation from major airport closest to winner’s home to New York, NY, 2 nights’ hotel accommodations (based on quad occupancy), $250 spending money, awarded in the form of a check, a “Perfect Fit” shopping spree, awarded in the form of a $5,000 Sponsor-specified gift card, 2 Macy’s personal shoppers (pending availability), 1 hour with a make-up artist in Macy’s beauty department (pending availability), and a 1 year’s supply of Juicy Juice product. 20 First Prizes: A $50 Macy’s gift card and a voucher for a Sponsor-specified Juicy Juice® product, up to a maximum value of $10. 30 Second Prizes: A $25 Macy’s gift card and a voucher for a Sponsor-specified Juicy Juice® product up to a maximum value of $5. Sweepstakes Random Drawing: The random drawing will be conducted by Brand Connections, whose decisions are final on all matters relating to the Sweepstakes, on or about September 13, 2016, from among all eligible Entries received. The odds of winning any prize will depend on the number of eligible entries received during the sweepstakes period. Have you finished your back to school shopping yet? Be sure and let us know how it is going in the comments and enter the Perfect Fit Sweepstakes brought to you by Juicy Juice® & Macy’s with your funny photo in the #PerfectFitSweeps. What a contest! This is a great prize. Macy’s is my jam! Entering! We just finished all of our back to school shopping last week. I was able to get it all done in one day. That is never an easy task in this house. What a fun campaign to get the entire family excited about back to school. My kids haven’t had juicy juice before but I’m sure they would love it. My daughter won’t be in school for a while but she does grow like a weed, so this would be great! My kids grow so fast. Just when I think we are set for clothing they are growing out of them again! I can never buy a head of time! This would be a fabulous giveaway to win! This is such a HUGE contest and giveaway! Congrats and kudos to you for being a part of this! What a great giveaway! Wish I’ll win the grand price – would love to have a vacay to NY with the whole family. What a great contest! Macy’s has some really cute clothing for kids! This is a great sweepstakes. We have to start our back to school shopping this weekend. My kids are grown now so I don’t have to deal with back to school shopping anymore. I don’t miss those days at all! What an awesome sweepstakes. My kids love juicy juice!! I plan on going to Macy’s to do some shopping soon. Such a great giveaway. I hate that my babies are not really babies. But I love that I get to watch them grow. This is a great sweepstakes, perfect for back to school! I love Macy’s, good luck everyone! What a great contest! We bought my daughter summer clothes in April and she’s grown out of them already with the summer not even over yet! My son grows so much in the summer. Maybe it’s from all the sun! lol Would be amazing to win this giveaway! Such a fun and awesome giveaway! Fall shopping can be so much fun!